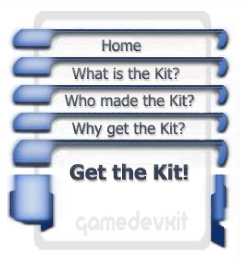 The Kit is information and forms that anyone interested in starting their own Game Development studio needs. It contains five basic sections. The brief description below of each section is followed by a link to a more detailed explanation of what each section of the kit deals with. The first section deals with why and how to form your own company. This section includes links to several web sites that can facilitate this process for you. Next is a section on Intellectual Property management. Here you will learn the reason why everyone contributing to your game, including you, must to sign a written agreement transferring their rights in the contents of the game to the company. This section also comes with a Contributor Agreement in a form that can be used or adapted to your specific situation. The third section of the Kit addresses communications between your team and third parties and discusses ways to protect your game idea while marketing your company and your game and includes both Unilateral and Mutual Nondisclosure agreements. Section four is a short primer on Copyrights and how they work legally. It includes application forms from the U.S Copyright office, complete with instructions. The final section has links to articles on starting a new game development company as well as links to many sites with a great deal of information on game development. Since this information is already available I am providing it here. The link below takes you to the actual page from the kit. Enjoy!